"Some risks are worth taking; losing your files is not one of them. WD Nomad rugged case cradles your My Passport portable drive in its polycarbonate case and shock-absorbing cushion lining, protecting your drive from drops, spills, dirt, dust, and scratches as you work and play." 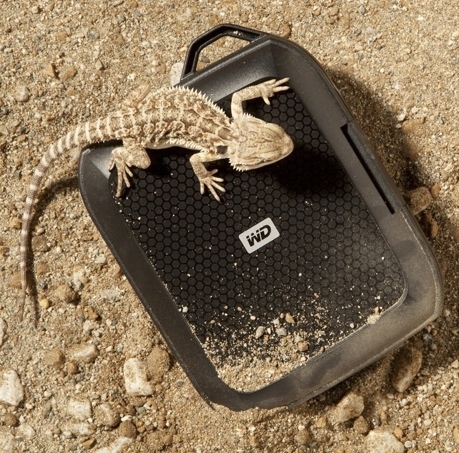 If you own a WD portable hard drive and use it in rugged conditions, then this new product will be of interest. WD has released the WD Nomad, a durable case designed to protect My Passport® portable hard drives from drops as high as seven feet, moisture and spills and other mishaps associated with active, on-the-go lifestyles, such as those of outdoor photographers, adventurers and other road warriors. The case features a polycarbonate exterior and shock-absorbing elastomer cushion inside. It conforms to strict military standards (MIL-STD-810G) for ruggedness. The heavy-duty latch and silicon liner seal out dirt, dust, and moisture. Our Read link has all the information you will need to evaluate the new case.